With my command prowess, and a significant payment to Digby's Paypal account, victory is assured. The other Martin - Charles Reille, le dernier Maréchal de France. "Any hussar who has not got himself killed by the age of 30 is a jackass." - Antoine Charles Louis Lasalle, commander of Napoleon's light cavalry, killed in battle at Wagram 6 July 1809, aged 34. I can play today at the usual time, 14:00 EST, 19:00 GMT. The Austrians suffered a slight setback Wed. as hoards of Mongol horsemen flooded the field in support of the French. Today's battle will go much better, I'm sure. I can make this march and I will make Georgia howl. I am playing today. Who else is coming? Kevin, I downloaded Gimp and converted the dds file sizes for the other Lace wars maps but I am getting game crashes when I try to open the minimap so it looks like there's some particular layering or mapping or some such setting th egame needs in its dds files. Is there any chance you could please convert all the other Lace Wars Mod dds files and put them up on your dropbox please? Sorry to be a pain... I have another scenario ready to go once I can test it on the map. I can play today at the usual time, 14:00 EST, 19:00 GMT. Friday's battle didn't go as well as it could have. One division was completely wiped out and another was reduced to one battalion and a few guns. Where are the generals of old? At least by comparison, today's battle almost has to end better. They are in the download channel now. My scenario design today Kevin, has 2 player corps, each of 2 divisions. The AI has 1 corps. Will this work as an MP game? If it won't I can easily rework it into 1 player corps. I've tested it in single player and the troops behave as I intend. Yes that will work just fine. Problems will only arise if the AI has multiple corps. Then it is slow to respond and commit the 2nd corps. Okay, thanks. Here's the briefing and details for today's battle. Following the defeat of the Duke of Wellington's Anglo-Dutch-German army at Waterloo on the 18th June, the British retreated through Brussels and fell back rapidly on their principal supply depot of Antwerp. The Hanoverian contingent fell back with the Duke's British forces but the Dutch-Belgian troops retreated west to Ghent where they have been reorganising along with those divisions not engaged in the Waterloo debacle. The lesser German contingents collapsed, the remnants retreating in confusion north-east towards the major elements of the Prussian Army of the Lower Rhine which was forced back beyond Wavre towards Louvain and Hasselt. The action fought by Grouchy against Blucher at Wavre on the same day that Wellington's Anglo-Dutch were crushed, was inconclusive. 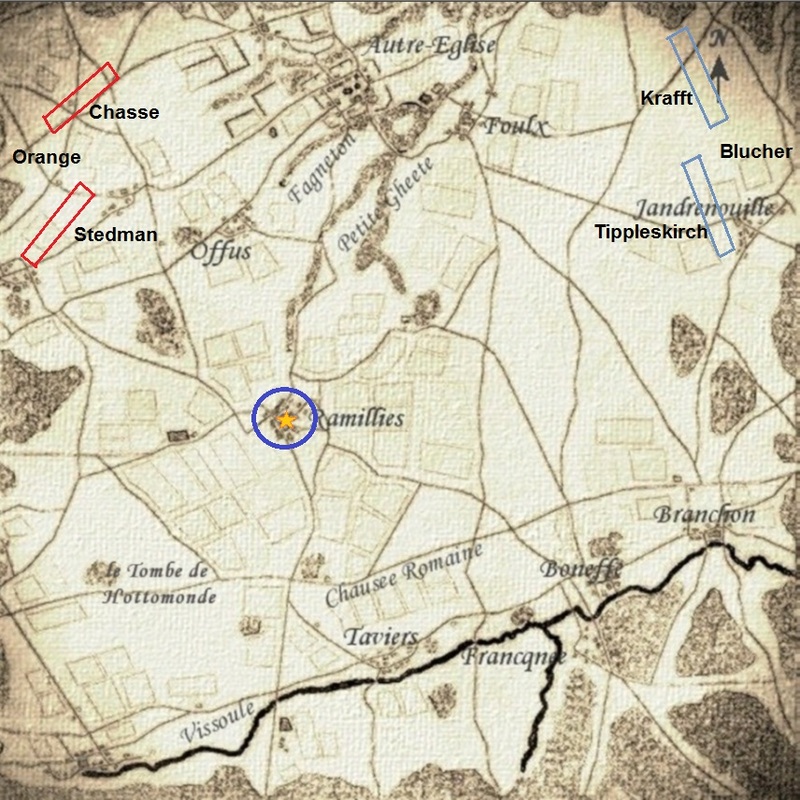 Grouchy managed to contain the Prussians and prevent them reinforcing the Allied left at Mont Saint Jean but with all four of the Prussian Corps present, Grouchy could not force a conclusive victory and only a messy stalemate was achieved, although this was enough to enable Ney and the Emperor to defeat the British. 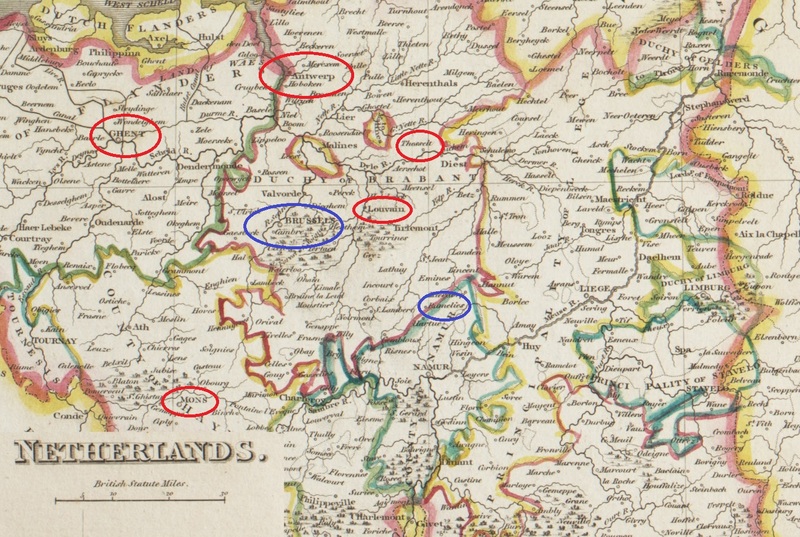 Blucher's army is therefore still largely intact and is now partly at Louvain and partly at Liege. The additional corps of the Prussian reserve are marching to the Rhine and will arrive within a week. The continuing resolve of the fiery Blucher to maintain the fight has caused some of the German contingents that were roughly handled on the 18th to rally with the Prussians and a new Federal German Corps is being assembled on the Lower Rhine. At Brussels Napoleon has been largely inactive, it is thought that the recurring illness in his lower bowel is worsening and the two wing commanders of the French Armee du Nord, Ney and Grouchy, have been at loggerheads, arguing over who has seniority. Grouchy eventually gave up trying to work with the nearly demented Ney, who has been insufferable since he was badly affected by the disaster in Russia three years ago. Grouchy took his army wing, and has fallen back south east to cover the French western frontier against the expected incursions of the Russians and Austrians. Brussels was stripped of most of its useful supplies by the shameful actions of the drunken louts of the retreating English army and it is now understood that Napoleon is dependent on supplies being forwarded from a massive magazine established at the town of Ramillies in eastern Belgium some miles north of Namur. Via secret communications, Blucher has been in contact with the Dutch-Belgian army commanded by the Prince of Orange and has agreed a joint attack on Ramillies to destroy the source of French supplies. Allied spies advise the Ramillies magazine is guarded by no more than a division which will probably not be a field formation and should be weak in cavalry and artillery. However should the French gain knowledge of any move toward Ramillies our agents report that is is almost certain that Ney will despatch probably a full corps to ensure it's security. With two Dutch-Belgian divisions moving from the north-west and two Prussian divisions moving from the north-east the plan accorded between the Prince of Orange and Prinz Blucher is to attack Ramillies from two directions and destroy the magazine. The town must be secured and occupied by at least 4 battalions for 20 minutes in order for the supplies to be put to the torch. After this the Allied forces may withdraw. Note that after the Waterloo debacle the Prince of Orange has insisted he will not act in a subordinate role to any Allied General and since Blucher is equally strong-willed, neither will he. The allied forces therefore comprise two separate corps with two commanders-in-chief. For Wednesday I can cook up another scenario using the Lace Wars Maps, although Kevin, if you want to play one you have up your sleeve we can do that. Your call, so please let me know. It would be a good idea if you created the next scenario. There is a good chance I won't be there for the battle Weds. Kevin can you send me the settings for hosting incase I need to host on Weds. I also have some scenarios made if needed but Digby's have been very enjoyable. We can use mine as a back up. I can play today, so can host if needed. Think I know the settings but would be useful just in case. Recovery from crash procedure would also be useful. Is it written down anywhere? I won't be there today so have fun beating up the AI in a completely unbalanced scenario. Here are the MP game settings I use. 1. The host saves the game before exiting or use the last autosave available. If you use the autosave, I suggest you rename it. Autosave has to be turned on in the games main options, (pg. 1). I set mine to 2 minutes. 2. The host creates a text file named restartmp.ini. name=Save2 (this is the name of the save game file). 4. The host places restartmp.ini in the scenario folder for the battle. 5. Once in the staging room the host, select the scenario and continue on as usual. Luckily, we didn't need to restart, except for right at the beginning with Connection crash. Just a few mins in, so started from beginning. I can play today at the usual time, 14:00 EST, 19:00 GMT. Martin, do you have a scenario ready? If not, I have a couple. I have one that we can use too. I can knock one up on the Blindheim map again, something akin to what we did on Wednesday but not attacking a Vauban fortress on the far side of the Okefenokee swamp after 2.75 hours of bloody fighting! I think our player team deserves to be Russians after a number of games using the scrapings of the barrel of Europe's so called "military" nations. I am available to play today at the usual 1400EST Who has the scenario today? Might there be player v player? A scripted AI? So many questions. I too can play today at the usual time, 14:00 EST, 19:00 GMT. Friday's affair saw the humans achieve an overwhelming victory. Clearly superior generalship was on the field that day. I only have the standard P vs AI made up, but Martin or Mike might have something along those lines. I can do a PvP in case we want to try one. Thats good. I have an 1807 player vs AI just created (players are French) so we can do that or Mikes PvP depending on how many masochists show up.